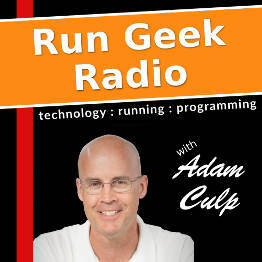 I have come to the realization that I am a “running geek” thanks to JayDub’s post on Galloping Geeks. He collected/wrote a fair list of observations about runners, and yes, I am indeed a ‘Running Geek/Nerd”. I ran an awesome 35 minute Tempo run yesterday. (click the link to see the Garmin results) I am really lovin’ the speed work. I was a little surprised at how the Garmin tracked my pace because I didn’t notice all of the up and down during my run, but my HR was very steady. One note I found interesting is that I did not feel the slight headache afterwards, so it appears my body is getting much better at processing oxygen on these speed runs. SCORE!!! This weekend I have a 6 mile marathon pace run on Saturday followed by a 13 mile long run on Sunday. I love the double runs on the weekends. The training plan I am following added the Saturday runs, and I am really liking them. On my past training plans I felt kind of lost on the extra rest day, but I will see how I feel once my mileage gets back up to 40+. I added the new countdown to the site for the San Francisco marathon. It seems so far away right now, but I know it will get here fast. I haven’t officially signed up for it yet, but will probably take care of hotel and registration soon. Take care everyone, and have a great weekend. Check out this cool Thorlo sock giveaway at My Reason To Run. Hi there–Just found your site via Viper’s. I see that you are a former NE Ohioan, as am I. You also have the best name in the world, my son’s! Looking forward to following your adventures. Nice job on your tempo run yesterday!! I think being a running geek is a good thing:) If someone called me that I would be flattered!! I hope that you have an excellent weekend Adam! I need to remember my running shoe signature, thanks for the reminder :). I haven’t read the geek/nerd article yet but I’m certain I can place myself in that category. Have a great weekend, Adam!!! Oooh I am so jealous I want to do the San Francisco marathon! Have fun on the long runs!! Adam, i’m a galloping geek too! San Fran was my 2nd ever marathon and my favorite ever. Not to mention the scenery is breathtaking and the weather is usually perfect. Have a good weekend of running! Nice job on the tempo run. I hope your weekend runs went well. I really love the back to back runs on sat-sunday. I am nearly positive that they help the most out of any back to back run. Nice work on the tempo! No headaches have to be a good thing!